RingSlingBabyCarriers.com: Want To Boost Your Baby's IQ? A Healthy Diet May Be Your Ticket. Want To Boost Your Baby's IQ? A Healthy Diet May Be Your Ticket. Researchers from Australia’s University of Adelaide have found a link between healthy infant diets and slightly boosted IQ scores. 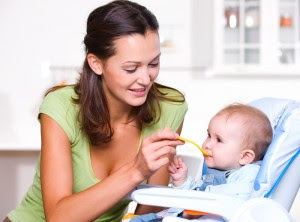 In the new study, the feeding habits of 7,000 infants were tracked when the children were 6 months, 15 months and 2 years old. The participants then took IQ tests when they reached the age of 8, and the researchers found that children who ate healthy diets between the ages of 6 and 24 months outperformed children who ate less nutritious diets. On average, children reared on healthy diets had IQ scores 2 points better than those who ate a lot of junk food during the study period. “Diet supplies the nutrients needed for the development of brain tissues in the first two years of life, and the aim of this study was to look at what impact diet would have on children’s IQs,” said study leader, Lisa Smithers, a public health researcher at the University of Adelaide. The study’s findings are not definitive, and the researchers acknowledge that other, unknown factors may also have caused or contributed to the difference in IQ. Researchers also admitted that the IQ spread among the control groups was clinically significant, but not very large. I hope you found this article on boosting babies IQ to be helpful.. If you are looking to find a baby carrier, it would be appreciated if you would check out my store. We offer Hotslings Adjustable Pouch, Rockin Baby Pouch, Rockin Baby Ring Sling, Seven Everyday Slings, and Lil Cub Hub Convertible Baby Carriers in a wide variety of fabrics and colors. Thank you for visiting my blog and hopefully also my website. Prices have recently been reduced on all products.